In the Shadow of the Moon - Solar Eclipse Alert! Any and all Chinese readers of this blog - take note! Depending on exactly where you are, you may have a front row seat for a total solar eclipse on Friday! The rest of us will have to be content watching it on the internet. A total eclipse of the sun happens with the moon passes directly between the Earth and Sun - momentarily covering it completely, and turning day to night. Relative to any fixed location on Earth, a total eclipse of the sun is a rare event. The last one visible from the continental U.S. happened in 1979 and the next one won't happen until 2017. From a global perspective, it's not so rare: a total eclipse is visible somewhere on Earth every few years. I exaggerate a bit when I say this is for Chinese sky watchers only - in fact, the event will be visible also from parts of Northern Canada, Greenland, various Arctic islands, Northern Russia and Mongolia. You can check out the projected path here. "Totality," the brief period when the sun is fully eclipsed, should happen just after 7 a.m. Eastern time. If you are lucky enough to be in the right place at the right time to see a solar eclipse in person, eye protection is key. You should never look directly at the sun with the naked eye. You need to to look through No. 14 welder's glass, aluminized mylar, or some other approved filter. The next total solar eclipse will happen just under a year from now, July 22, 2009, and also will be a largely Asian show, though Hawaii will catch the tail end of it. I better get my request in now to go cover it for CNN! Just before the sun dips below the horizon, sometimes a brilliant green or blue flash appears at the edge of the fiery ball. To see it, you have to be somewhere with an unobstructed view of the sun and a very stable atmosphere. The perfect spot is the Cerro Paranal Observatory in Chile, perched on a 2,635-meter (8,645-foot) mountain in the Atacama Desert, where they get an average of 300 cloudless days per year. 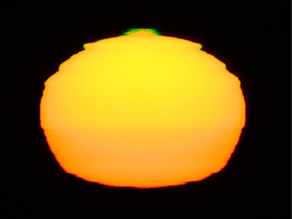 Check out these images, as well as another solar phenomenon called a "Gegenschein." The observatory, which is operated by the 13-nation European Organisation for Astronomical Research in the Southern Hemisphere (ESO), is home to the Very Large Telescope (yes, that's the official name), which ESO describes as the world's most advanced optical instrument. The green and blue flashes happen when Earth's atmosphere acts as a giant prism, refracting certain colors from the setting sun's rays. It's a tradition at Paranal for the staff to gather at sunset every day to watch for the flashes before settling down for a night of astronomical observations, according to the ESO Web site. But kids, don't try this at home – at least not without proper eye protection. 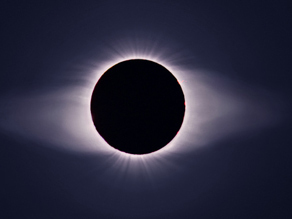 The ESO site emphasizes that looking at the sun with the naked eye is dangerous, and looking at it through a camera, binoculars, or telescope is even worse. "Do not attempt to observe the Sun unless you know what you are doing," the site warns repeatedly.